The San Francisco Bay Area’s Water Emergency Transportation Authority, which is facing massive ridership increases, is relying on our marine team to design, install and maintain the propulsion systems for its newest ferries. 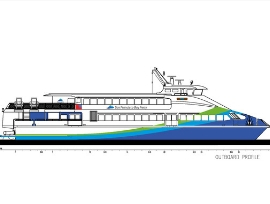 The three new ferries that will go into service next year are part of WETA’s larger plan to expand its fleet to meet a ridership increase that is projected to be as much as 900 percent by 2035. The marine group, which has a long history of working with WETA and other ferry operators in the Bay Area, will not only design and install the propulsion systems in the newest ferries, but will increase its capability to service the entire ferry fleet in the in the San Francisco Bay. All three ferries will be powered by MTU Series 4000 engines. The three vessels are being built by Dakota Creek Industries of Anacortes, WA. Each ferry will be fitted with two engines, two gear boxes, two propulsion shafts and a set of controls. The high-speed water jet ferries can carry 445 passengers at a top speed of 34 knots or 39 mph. The vessels are testing the latest generation MTU Series 4000 engines designed to meet Tier 4 Final regulations. WETA’s almost exclusive reliance on MTU engines has allowed the fleet to see continued efficiencies, especially in terms of shared parts inventory. The engines also run longer between maintenance intervals, at faster speeds and with decreased fuel costs. To ensure those performance standards are maintained, we will be staffing a full-time maintenance crew in the Bay Area for the first time in the company’s history. This maintenance agreement is a continuation of our marine group’s long history of working with MTU and ferry operators in the Bay Area. We previously outfitted several ferries with an aftertreatment process that improved emission standards. “The faith that MTU has put in us to maintain the existing and new ferries is a great honor and one we look forward to upholding,” said Schwedland. The first of the newest ferries, the Pyxis, is expected to begin service early 2019 with the Vela and Lyra coming later in the year. WETA currently runs a fleet of 13 fast ferries, 11 of which are powered by MTU, and serves 2 million travelers a year. The three newest ferries are just the beginning for WETA, which expects to add a total of 44 vessels by 2035 to meet a projected increase in ridership. Together with MTU, we are poised to meet WETA’s future needs.